Posted on August 5, 2010 under Travel. The day dawned and the daylight dispelled the miasmas of the previous day. We were in high spirits!! The day comprised of an trip to some of the famous Monasteries near Leh. We first visited the Hemis Monastery. After a scenic ride to Hemis, we disembarked and got our first glimpse at a Ladakhi Monastery. The narrow doorway to the monastery barely prepared us for the splendour and rich colors that the interiors held. 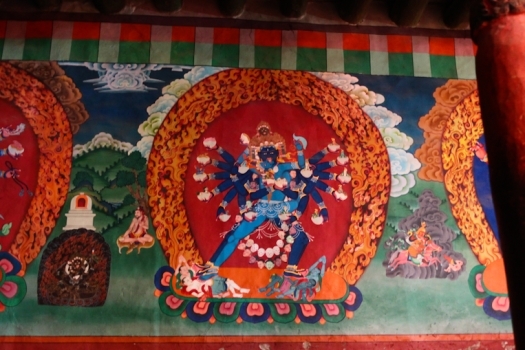 It was breathtaking, especially the intricate paintings on the walls of the Monastery. After spending about an hour there we moved onwards to our next destination – Thiksey Monastery. 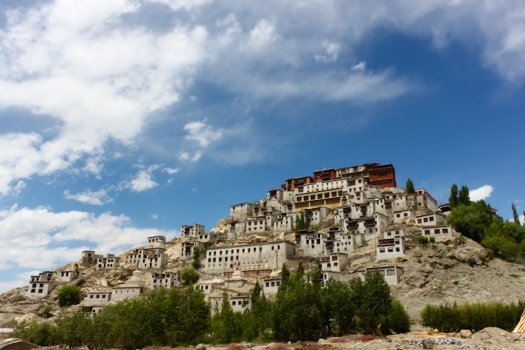 Thiksey, in my opinion, was one of the most scenic monasteries that we visited while in Ladakh. Once again we quickly saw the interiors of the monastery and moved on to our next stop – Lunch. Lunch was a simple vegetarian meal at a roadside eatery near Shey Palace. The palace used to be the summer palace of the erstwhile kings of Ladakh. While not much of the splendour of yesteryear’s is on display in the palace, one can definitely get a feel of the grandeur of the days gone by. After Shey Palace, the last stop of the day was Stok Palace. This is the current residence of the former kings of the Ladakh region and many of the ceremonial garbs, ornaments etc are on display at the Palace. On our way to the palace, the sky suddenly grew quite overcast. That along with the barren terrain, made the trip quite surreal – like we were driving up to some gloomy medieval castle. The Palace did have an excellent museum, which had some really unique items. On display was a monstrous head-ornament which the queen is rumored to have worn, swords twisted by the King’s Oracle, various curios etc. After seeing the Palace, we headed back to our hotel in eager anticipation, since tomorrow was the day we’d go to Pangong Lake ! !